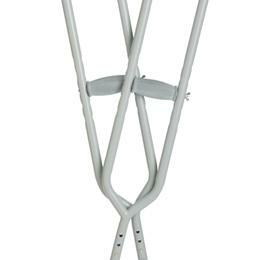 Bariatric Crutches: Heavy-Duty Steel Construction Provides Durability And Supports Up To 550Lbs. Push-Button Adjusted Foot Pieces With Fitting Scale Allow For Accurate, Fast Fitting. 1" Adjustment Increments On Both Handle And Height Provide A Precise Fit Which Reduces Muscle Fatigue. Tall Adult.